I can’t believe how busy I have been this week. I haven’t blogged. I haven’t read blogs. I haven’t even knit much, although the Moosecreek socks progress in tiny increments. Strangely enough, although they are starting to feel like the socks that never end, I still love them and I do feel like I make progress every time I knit them. The pattern is fairly simple, for all it looks relatively complex, and I only have to pay attention once every 4 rounds. So it is good for TV watching, etc. — if I had time to do that. But I do want to get them finished. This is the April Rockin’ Sock Club yummy. It’s called Walk The Wild Tide, and it’s a brand new Blue Moon yarn called Silkie — both the name of a chicken, and an indication of the fiber content — 81 % superwash merino, 19% silk. And look at the color! Doesn’t it look like it’s blooming amongst my wisteria? 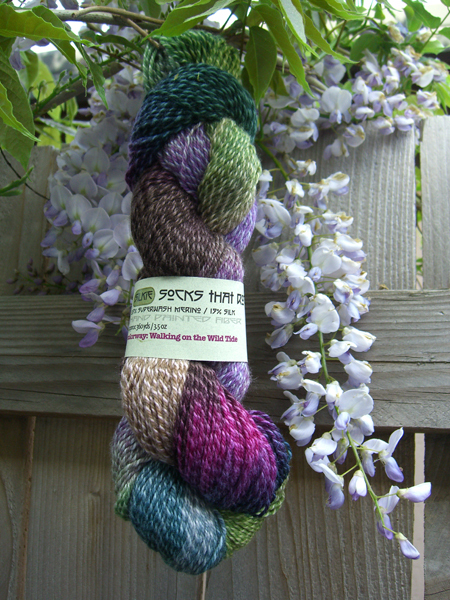 The silk and the wool took the dye differently, causing multi-hued light/dark yarn. And the silk gives that nice silky glow. The inside of the ball band on my skein said bladder fucus. That made me raise my eyebrows a bit — ‘scuse me? Bladder fu. . . ?!?!?!? But, thanks to Wikipedia, I know that bladder fucus is another name for bladder wrack, also known as that cool seaweedy stuff with the bubbles in the stems that you can pop and not, thankfully, either a swear word or a disease (as though the lovely Blue Moon ladies would either swear or toss diseases around willy nilly on their ball bands). Bladder fucus bears no resemblance to this yarn, however. None. I can positively state that I have never had the desire to fondle bladder wrack. Once again, though, I don’t think I will be knitting the pattern that came with the yarn. It’s a standard toe-up, flap-and-gusset heel sock. 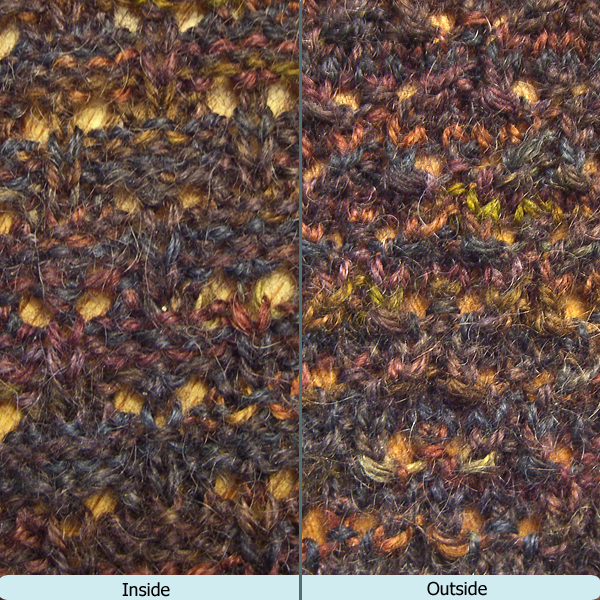 But the stitch used is a YO, P2tog lace — a true lace that is worked on all rows. 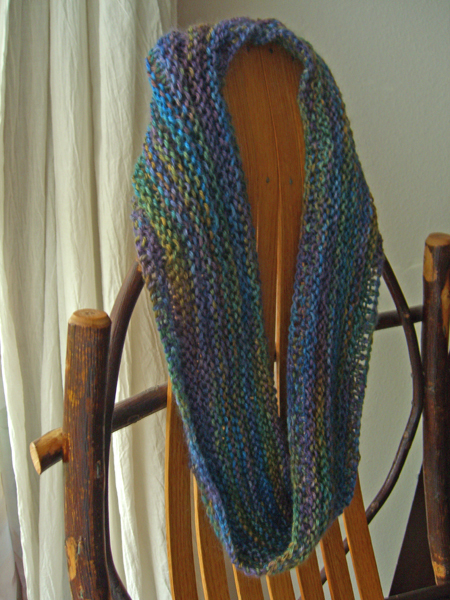 It makes a very nice bumpy netting that I think would look great with a solid-colored yarn. With this yarn, the lovely colors got lost inside the netting. I swatched it on US#2 and was way off on gauge and not loving it. So I swatched it again on US#1 and got gauge, but still didn’t love the stitch. So I frogged it again and knit a swatch in the same track of the turtle faux cable pattern as the Snake River Socks. This time the pattern got lost inside the colors. Here I’ve swatched a simple basket-weave pattern I am sort of liking this one. It still has the nice bumpy purls, but there is enough smoothness that the colors pop instead of being lost in the netting holes. What do you think of this idea, gentle reader? I’ve knit basket weave socks, and was pretty happy with them. The Silkie yarn has been wonderful to knit with. It’s very soft and squooshy. It’s not very tightly twisted, and I was concerned that it would be splitty, but that has not been the case. It slides right off the needles and there’s nary a split in sight. Tough, too. The yarn that I swatch and frogged out 4 times still looks like I just wound it off the hank. The crocheted doily was made by my Great Aunt. It’s probably around 80 or 100 years old, but I don’t have any way to date it definitely. Nor do I know which of my Great Aunts actually made it. Several of them crocheted. I have quite a few doilies — crocheted, knitted and tatted — and I try to find uses for them here and there. There won’t be much bloggage this coming week, either. I will be very busy at work — so busy that I will not have computer access because I won’t be actually in the office or at home much. #1 Son is off to parts north for a month, on tour again. They have booked a show on a ferry, and I am dying to hear about that one. The Persistent Illusion blogiversary is coming up this week. I can’t believe I’ve been at this for 3 years. My first blog post was titled So What Do I Do With A Blog. Sometimes I still wonder. 😆 But I can also answer confidently: I make friends, I meet wonderful people, I learn new things, I join an amazing community of knitters all over the world. Blog content may be spotty at times, but I can’t imagine not doing it at all. Saturday morning, #1 Son called me: Hi, Mom. We’re going down to Eugene to see a show. Taking my car. I’ll be back tomorrow, probably in the early afternoon. Definitely in time to have dinner with Uncle Bro. Sure, I’ll call you when I get back. Monday morning, #1 Son called me: Hi, Mom. I forgot to call you last night to tell you I was driving up to Seattle. That’s where I am now. I’ll be back home probably late tonight, but maybe tomorrow. Yeah… I’ve been coming up here more than I’ve told you about. I’m sorry I keep forgetting to call you and tell you. I’ll try to be better about that from now on because I know you like to know where I am. Now… It’s around 120 miles from Portland to Eugene. It’s about 175 miles from Portland to Seattle. This is the same #1 Son who will not drive the 10 miles to my house because it’s too far and gas is too expensive. When my brother and I were children — way, way longer than I care to admit — we loved to listen to music. (Still do, of course.) This was back in the days when music meant a jukebox (I’m old enough to remember a cafe that had a jukebox selector at every booth), or the radio, or the record player. It played vinyl records, boys and girls. 8-tracks had not been invented yet, and ipods were not even a dream in Steve Job’s brain. At any rate, we listened and listened and listened to those poems until they became old, familiar friends. So imagine my delight when I learned that we needed to memorize 50 lines of poetry for English class the year that I was a Freshman in High School. OK… I wasn’t so thrilled to have to memorize poetry (I was a normal kid). But I was thrilled when I saw that one could either memorize several smaller poems, or get the whole thing over at one whack (and get extra credit besides) by reciting Gunga Din. The only hard part was to avoid bursting out in song during the chorus. 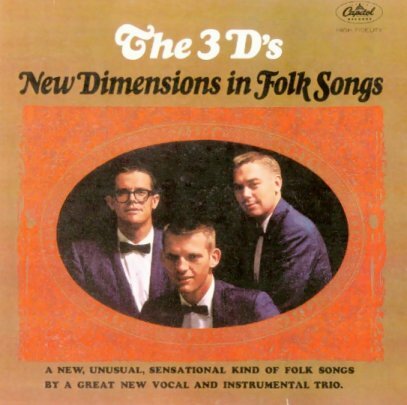 Something brought the 3D’s to mind not long ago, and I wondered if their album had ever been released on CD, or was downloadable, or otherwise available. And a bit of googling turned it up. One of the D’s has released it. I ordered a copy for myself and a copy for my brother (his b-day prezzy). And I sent an email with a very belated thank you for the A in Freshman English. Bro, niece Z, #1 Son and myself had dinner last night. I’d made a Have A Groovy Birthday card for Bro, complete with peace signs and smiley faces (gives you an idea of the decade that I was a Freshman). Bro was thrilled with the CD and listened to it in his car all the way home. No word on what niece Z thought about it. If you want your own copy, you can order it from Phoenix Records on either CD or cassette. Knitting: I have been super slammed at work, so not much knitting is being done. But I have managed to turn the heels on the Moosecreek socks, and I’m heading up the legs. 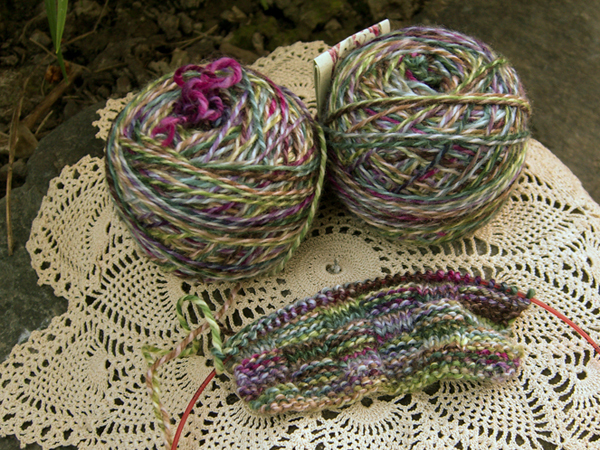 Rockin’ Sock Club yarn should be coming soon, and a new sock class starts in a couple of weeks. So I need to get these puppies off the needles. With all of the distraction of moebii, I haven’t done a lot on the Moose Creek socks, but you can see that they are moving along. I have managed to knit my way up to the gussets. I have about two more increase rows to go before turning the heel. I think about two more. These socks are slightly off my normal gauge and I haven’t bothered to do the math yet. You will remember, gentle reader, that I started these socks just before the Magical Moebius Festival, where all thought of this pair was banished from my mind, to be replaced by the lovely moebius and other, very cool, socks. Not that these socks aren’t cool. I love the way that this little lace pattern (the repeat is only 6 stitches by 8 rows) is knitting up. The outside is all textured and bumpy and cushy. When I first started, I mentioned that Barbara Walker thought the wrong side of this pattern resembled little elephants. I wasn’t so sure, but I hadn’t gotten very far yet. The left side of the picture is the inside or wrong side. I can see the little elephants now, the lines of knit stitches making their little trunks. Cute little guys, eh? I hope you can see the stitch pattern well enought to see the little animals. I’m finding this yarn very difficult to get good close-ups of. The top picture, with the socks reclining in my little boat basket (that’s what I call it), is pretty close to the actual color. Dark. Dark and rich. Dark chocolate with little touches of milk chocolate and a bit of midnight blue. If I had one of those amazing, bazillion-pixel cameras with close-up lenses and all, I could probably get a better picture. But then I couldn’t carry my camera around in my purse and madly snap picture everywhere I go. It’s a trade-off. Note to everyone: I cannot write about the horror at Virginia Tech. My heart goes out to the families and friends of all those involved. When last we saw the moebius from hell that I made way, way too long, it had 11 women inside it. That was really too many, as I’d intended it to be worn around only one (preferably me). But stuff like that makes my head spin a bit, both with weirdness and with the sheer coolness of the whole thing. Regardless… the three dimensional representation of a Moebius strip that I knit was way too long. It was frogged and re-knit. Alice and K of Tangle are modeling it. As you can see, it’s really a bit too tight for two. But it fits one just about right. In search of some decent light, I looped it over the back of one of my rocking chairs. (I love rocking chairs. My former brother-in-law once asked me why I couldn’t seem to have a chair in my house that didn’t rock or swivel or recline or otherwise move. But why would I?) This chair is one of my favorites. The back is at a slightly strange angle because Moo Cow was occupying the seat, trying to pretend that she didn’t really want to grab the Moebius and start eating the yarn. Not really. Well… maybe just a little. I love the colors in this yarn. The silk content (30%) gives it such a pretty sheen, and the mohair makes it so soft. Yum. I knit it on larger needles to give a rather loose fabric. I think the drape is just about perfect. I’m very pleased. Now. Note: I acquired this yarn by purchasing this poncho kit. I’m not a poncho person – just wanted the yarn. Kid Silk has been discontinued by Fleece Artist. The kit included 410yds of Kid Silk. I used less than 1/2 of it on the moebius. The remainder is in the stash with no project in mind yet. Yarn: Fleece Artist Kid Silk (70% Kid mohair, 30% silk / 200m; 100g) colorway: Mermaid. Pattern: from Cat Bordhi’s A Treasury of Magical Knitting, with a few minor modifications. Why does the word inventory contain the word invent? According to my Oxford, both words have the same root — the Middle English word meaning to discover. But we use them in such different ways. Or do we? Obviously we discover new things as we create. What can we discover about our inventories? Over there to the right is the sidebar of shame my list of unfinished projects. I do finish these every now and then. 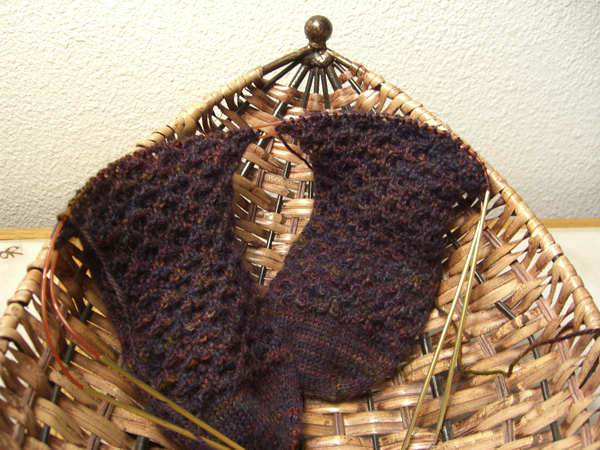 Note that the re-knit moebius is complete! And it’s the right length! And there was much rejoicing! (pictures soon) But also sometimes those projects tend to hang around forever for longer than I’d care to discuss. Last Saturday at Tangle, Alice, K, Nurse Knitter and I discussed our projects: Projects present, projects future, projects of our dreams, projects forgotten, projects hanging around like sulky children whining for attention. Projects. Since the others do not possess a sidebar of shame public place to flaunt their embarrassment handy place like a blog to keep track of their projects, someone more clever than myself suggested that perhaps having an inventory page that could be kept in a binder or file would be helpful in remembering just what projects may be buried in forgotten corners of unused closets temporarily on hold. We came up with a few useful categories that projects could be slotted into, and a few guidelines, and the intrepid Alice created a lovely little inventory form. There was one knitter there who (I know this is hard to comprehend) only buys enough yarn for her current project, and never has more than one project going at a time. I had never really believed that such a mythical creatures existed, but there she was! I don’t think she quite knew what to think of my remark that on the needles was the best place to keep track of my stash. Plans â€“ ideas I am thinking of, patterns I have acquired, I feel the need to add these to my life sometime in the future. If you would like a copy of the Knitter’s Inventory, you can download one from Tangle’s site (click on the link), or from my site by clicking here. You, too, can be amazed when you discover your inventory have a handy way to keep track. I’ve updated the sidebar of shame my list to fit these categories. 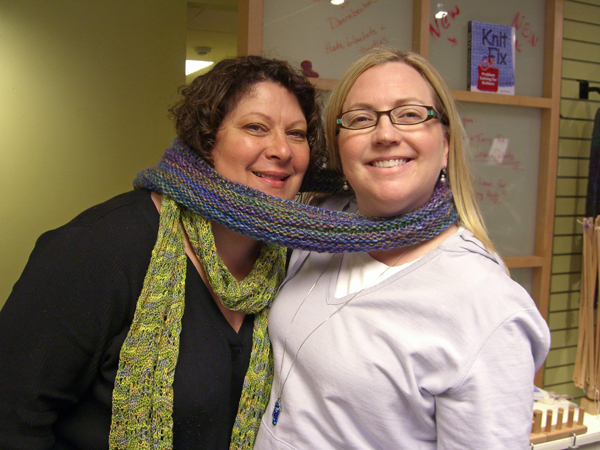 With wonderful timing, Ann & Kay from Mason-Dixon Knitting have started a new… slogalong. It celebrates those projects that just go on and on and on and on until you wanna stick one knitting needle through your right ear and the other one through your left eye because you know no matter how far in the future it will be (and hopefully it will be a long time) you will be buried with the #$(@% thing. If you have projects like that, head over to the slogalong site and sign up. We can all slog together. Because I don’t have enough unfinished projects competing for my time, 🙄 I’ve signed up for Sockapalooza 4. What the heck. Chances are good, after all, that some time between now and August 2 (the deadline), I’ll knit a pair of socks. And it was a lot of fun last year. If you are interested in joining, head over to The Blue Blog and sign up. But better hurry — Alison will have registration open only until midnight! (Or maybe a little longer if the new baby — what a cutie-pie — keeps her busy.) It’s OK if you’re a new sock knitter. New knitters will be paired with new knitters, and there are tons of other knitters to help out if you have questions. And better still, you and the front loader got it done. Gives me hope for my front loader. hahahahahaha Can you just see a giant pen pod? Maybe I could felt my entire cube at work! That might raise a few eyebrows, though. But it would look so cool! A cat is a puzzle for which there is no solution.